More Transit Service or Lower Fares? As the economy gradually improves, some transit budgets are looking a little rosier. In a few rare cases, transit agencies even have a surplus and need to decide how to handle it. OPAL’s demand for a fare cut costing $2.6 million (about 2% of the agency’s revenue) is, mathematically, also a demand that Tri-Met should not restore frequent service. This money (about 80 vehicle-hours of service per day) is more than enough to restore frequent all-day service on several major lines. OPAL’s position is that because service has been cut, Tri-Met must mitigate the impact on low-income people instead of just fixing the problem. In particular, OPAL wants a solution that benefits only people who are money-poor but time-rich, a category that tends to include the low-income retired, disabled, and underemployed. You must be both money-poor and time-rich to benefit from a system that reduces fares but wastes more and more of your time due to low frequencies and bad connections. If, on the other hand, you are money-poor and time-poor — working two jobs and taking a class and rushing to daycare — you will benefit from a good network that saves you time as much as from one that saves you money. But that means you don’t have time to go to meetings or be heard. We transit professionals see these busy low-income people on our systems and care about their needs, but we also know that we’re not going to hear their voice as much from advocacy organizations, because they just don’t have time to get involved. The same is true, by the way, of the vast working middle class. In the transit business, we get lots of comments the money-poor-but-time-rich, who have time to get involved, and from the wealthy, who can hire others to represent them. We don’t hear as much from the middle class or from the money-poor-and-time-poor, even though those groups dominate ridership. But hey, we understand! They’re just too busy. Elsewhere on the Network today: The Urbanophile explains some of the reasons suburban office parks are increasingly becoming “suburban corporate wastelands.” Parksify explores the new park Dallas built over a recessed downtown freeway. And Bike Walk KC reports that the first streetcar tracks have been laid in Kansas City. 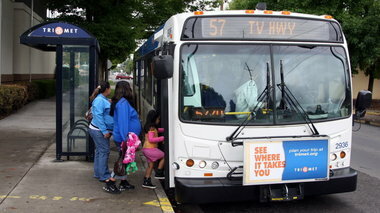 TriMet says bus ridership is falling the most in areas where lower-income residents are getting displaced. Chasing the Elusive New Transit Rider, Missing the Bus?